Air-conditioner is widely installed in Singapore and used by locals to keep ourselves cool. You can find it everywhere in Singapore, wherever you go. The air-conditioner is no difference from any other mechanical where regular servicing and cleaning is required to keep the units in good condition. However, if your air-conditioner is not being serviced for a period of time, it will result in a build-up of dust, dirt and debris which will significantly affect the efficiency and condition of your units. Thus, in this case, you might need an aircon chemical cleaning to improve the condition of your units. By having a thorough air-conditioning chemical cleaning service, it will keep your air-conditioner clean and ensure proper operations. This is especially important when the weather is hot and humid in Singapore which makes the aircon prone to problems such as malfunction issues. Thus, in order to prevent your units from facing problems in a hot and humid weather, you need have your aircon regularly serviced and cleaned to keep your units in working condition. Other than chemical cleaning aircon service, we also provide a more thorough cleaning service, aircon chemical wash, you can find out more about our chemical wash and see if it is more suitable for your aircon system in your home or office. So what are the benefits of opting a chemical aircon cleaning service in Singapore? When comparing general aircon servicing and chemical cleaning service, chemical cleaning is a higher grade of cleaning service as it includes using of professional chemical products to clean the air-conditioning system. 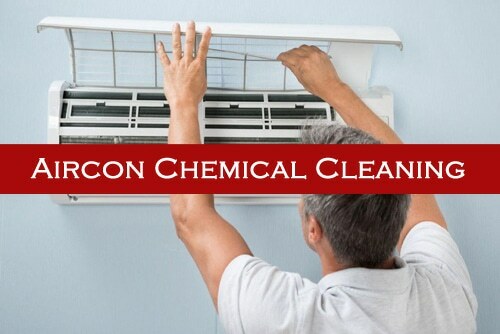 A chemical cleaning service is necessary depending on the condition of your air-conditioner. Chemical cleaning may not be necessary as often as general aircon servicing, however, ensuring your air-conditioner units having chemical cleaning once annually will keep your units in good working condition and extend the lifespan of your system. Air-conditioning chemical cleaning is effective and helpful if you have family members or colleagues who have allergies or have an illness such as asthma or skin issue. This is because, the use of chemical products in chemical cleaning will remove and clean all the dirt, dust, bacteria and harmful substances that have grown and accumulated in the unit. Furthermore, not only the coil will be cleaned with chemicals, other parts and components will also be cleaned. Thus, by engaging chemical cleaning service, you can ensure that your aircon including different parts such as air filters are cleaned well. This will ensure that your air-conditioner is cleaned thoroughly and improve the indoor air quality which makes the air that you inhaled cleaner and fresher. All these will contribute to a better environment for people with allergies or illness such as asthma to live or work in. So you may wonder how chemical aircon cleaning works. Chemical cleaning aircon is a process where your air-conditioner is being cleaned with chemicals. In aircon servicing, different parts and components in the unit is being cleaned with non-chemical products. However, in a chemical cleaning, the units will be cleaned with quality chemicals and professional equipment. An air-conditioner chemical cleaning service in Singapore will ensure that your units is cleaned thoroughly where it will remove the dirt, dust or debris that have accumulated around the unit. This will improve the cooling efficiency, airflow of the unit and the operating efficiency, which help to keep your air-conditioning system in good working condition. Chemical cleaning is a better grade of cleaning service as compared to general aircon servicing. It provides a more thorough cleaning with the use of chemicals as compared to general servicing. Hence, if you found out that your aircon units is full of dirt or dust or it is not being serviced regularly, causing the accumulation of dirt, you can opt for a chemical cleaning for your aircon units. If you like to book a chemical aircon cleaning appointment with us, do not hesitate and contact our friendly staff. We believe that we are able to provide you with quality chemical cleaning for your air-conditioning system. With proper chemical cleaning services for your aircon, all these dirt, dust, bacteria and other harmful substances will be removed in your unit which will improve the condition of your unit. We provide chemical cleaning service for all residential, commercial and industrial clients in Singapore. If you like to find out the price of our chemical aircon cleaning service, you can contact our friendly staff for more information. With the rising temperature in Singapore, it is essential to take good care of your air-conditioner by having regular servicing or sometimes if necessary, chemical cleaning service for your home or office.